... the light areas are substantially unsaturated. They're similar in color and intensity to what we'd see with a redder palette, as well. At that point color is just a cast. The brightest areas in any image tend to be white. <<That's what brown traditionally is, though. It's a special name we have for a desaturated zone of red and orange. It's the only desaturated color we have that is considered discreet. All others are recognized as pastel or drab versions of their saturated basic colors. It's very interesting to me that this happened. If you explain this to someone unfamiliar with color they will be incredulous that brown is related to red or orange at all. Re: Are we dun here? neufer wrote: The brown and orange disks of color are objectively identical, in identical gray surrounds, in this image; their perceived color categories depend on what white they are compared to. This, of course, is why discussing colors is difficult. We can talk about colors in terms of ratios of primaries, but since color is a physiological phenomenon, that only gives a part of the picture. Nevertheless, it is possible to make some reasonably absolute statements, such as "simply adding blue to an RGB mix that appears broadly orange will not shift it towards brown; something perceived as brown is created by reducing the intensity of something that is perceived as orange". That is generally true (although I don't discount the possibility of someone creating an optical illusion that puts even that into question under very contrived conditions). I've been thinking about the question of creating colors by combining red, green, and blue light. Is this purely a technical issue for people who are creating digital images or television pictures, or is this analogous to what happens in nature? I think of the light that comes from the Sun or another star as having a continuous spectrum of all the colors of the rainbow, with interesting dark lines where specific wavelengths of light are absorbed by elements or molecules in the star's cooler outer layers. An emission nebula or a reflection nebula would have a much narrower spectrum, but it would be centered on a specific wavelength corresponding to a specific color, right? Am I missing something? Anthony Barreiro wrote: I've been thinking about the question of creating colors by combining red, green, and blue light. Is this purely a technical issue for people who are creating digital images or television pictures, or is this analogous to what happens in nature? I think of the light that comes from the Sun or another star as having a continuous spectrum of all the colors of the rainbow, with interesting dark lines where specific wavelengths of light are absorbed by elements or molecules in the star's cooler outer layers. An emission nebula or a reflection nebula would have a much narrower spectrum, but it would be centered on a specific wavelength corresponding to a specific color, right? Am I missing something? Color theory is very complex. Consider just the simple fact that we may perceive identical colors created by a single narrow emission line or a rich mixture of wavelengths across the spectrum. Consider that we perceive a particular hue as different colors depending on intensity. The thing that distinguishes orange and brown, for example, is intensity, nothing else. The sensors in our eyes don't correspond very closely with the red, green, and blue primaries of our monitors, nor with the cyan, magenta, and yellow of our subtractive color systems. So displayed colors, printed colors, and the colors we perceive all occupy different mathematical spaces. Converting between them is non-trivial (and there are many things that can't be converted perfectly- for instance, it is impossible to duplicate pure red in the standard additive system used by monitors using the CMY system of printing. Chris Peterson wrote: Color theory is very complex. Consider just the simple fact that we may perceive identical colors created by a single narrow emission line or a rich mixture of wavelengths across the spectrum. Consider that we perceive a particular hue as different colors depending on intensity. The thing that distinguishes orange and brown, for example, is intensity, nothing else. Thanks Chris. Simply the fact that the same perceived color could be a single wavelength or a continuous spectrum is enough for me to meditate on for now. We go through our days unconsciously assuming that the world is as it appears to us, but it's not! I wonder if that's why the blue reflection nebulae stand out in clear contrast in this image? There are no blue reflection nebulae visible in this image. The small bluish areas in this image get their color from OIII emission due to strong ultraviolet emission from very hot stars. The reason why the bluish areas are so small is likely twofold. It seems very probable that the Heart Nebula contains considerably more Ha than OIII emission. However, it was also the choice of the person processing the image not to emphasize the OIII emission and therefore "keep down" the blue channel. Another Hubble Palette image of the Heart Nebula shows a lot of blue, but again that must have been the choice of the person doing the processing. 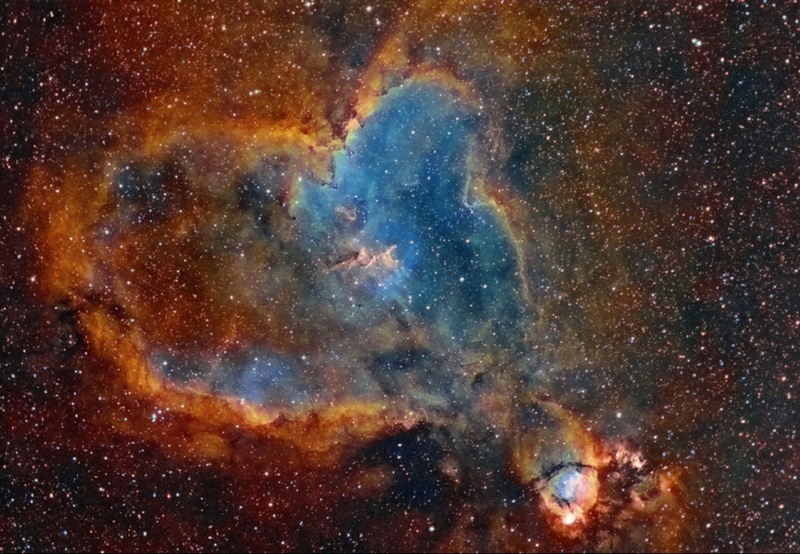 In any case, the blue areas in the Heart Nebula could not have been reflection nebulae. OIII emission is only found in rarefied, "empty" areas near energetic stars or near "energetic events" such as supernova remnants, whereas (blue) reflection nebulae are always found in dusty areas.